An X-ray machine is very expensive. Do everything possible to keep it in good working order by following the user maintenance procedures contained in the manufacturer's instructions. General user maintenance includes dusting the X-ray machine daily, and removing blood and debris from all surfaces using a cloth moistened with detergent solution. Follow disinfection procedures discussed later in the chapter. NOTE: DO NOT use a wet cloth; moisture might enter the control panel causing an electrical short circuit that could cause severe damage to the machine and possible harm to the operator. DO NOT use cleaners or solvents. Never attempt to repair the X-ray machine yourself. If it breaks down, report it to your supervisor. All repairs are the responsibility of the dental equipment repair technician. Intraoral radiographs are made with the X-ray film placed inside the patient's mouth. There are three types of intraoral radiographic examinations: periapical examination, interproximal (bitewing), and the occlusal. To ensure diagnostic quality radiographs, you must properly align the X-ray film, the area to be X-rayed, and the tube head cylinder of the X-ray machine. Alignment can be accomplished by using either the parallel film placement technique (preferred method) or the bisecting angle technique. The following discussion provides detailed information on how to take periapical and interproximal (bitewing) radiographs, using both techniques. For the occlusal examination, you will use only the bisecting angle technique. The X-ray films used for intraoral examinations differ in size, depending on the type of examination. 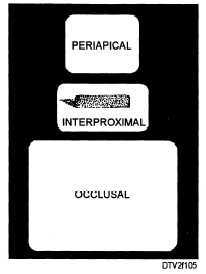 Figure 1-5 compares the sizes of periapical, interproximal (bitewing), and occlusal film. Figure 1-5. - Intraoral X-ray film. times given in the following sections are for D speed film. Intraoral film comes in film packets, with a lightproof and waterproof outer wrapper. 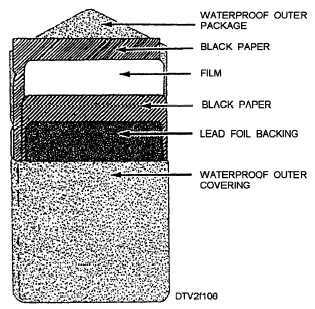 Inside the wrapper, the film is sandwiched between black protective paper and backed with lead foil. Figure 1-6 shows a partially unwrapped periapical film. Figure 1-6. - Partially unwrapped periapical film.